Mirror invitations are one of the hottest wedding trends. We designed these mirror invitations with a vintage bracket and brocade pattern printed with ivory ink. Each invitation was wrapped with a gatefold printed with a tone on tone pattern and a die cut seal. Their J and L monogram was laser cut silver metal. Inside the gatefold, we mounted a die cut pocket printed with the same tone on tone pattern. It held the foil printed response card and matching rsvp envelope. 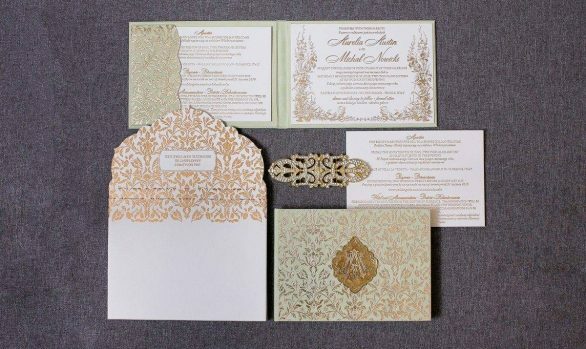 The reception card was designed with the same vintage bracket and pattern. Custom invitation boxes were printed with the guest’s address and matching monogram stamps completed the entire suite.